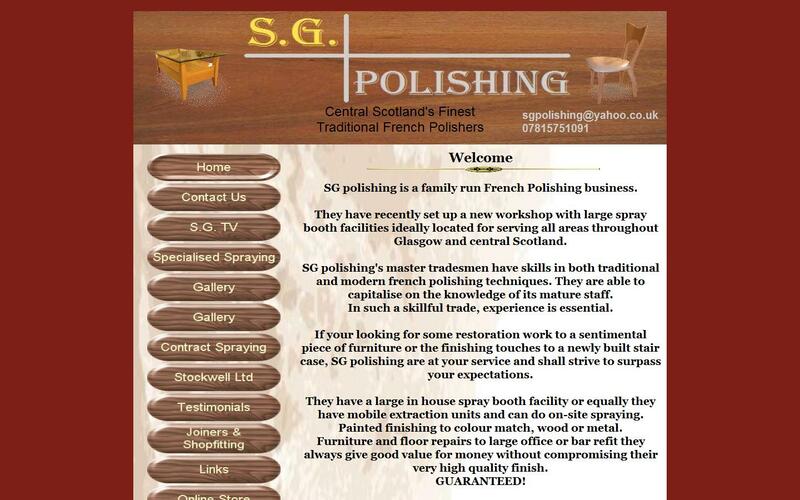 SG polishing is a family run French Polishing business based in Cumbernauld, Glasgow. Covering all areas throughout central Scotland. SG polishing's master tradesmen have skills in both traditional and modern french polishing techniques. They are able to capitalise on the knowledge of its mature staff. In such a skillful trade, experience is essential. If your looking for some restoration work to a sentimental piece of furniture or the finishing touches to a newly built stair case, SG polishing are at your service and shall strive to surpass your expectations. They have a large in house spray booth facility or equally they can do on site spraying. Painted finishing to colour match, wood or metal. Small furniture/floor repairs to large office refit they always give value for money without compromising their very high quality finish.GUARANTEED! SG polishing was established in 2000 by proprietor Steven Gannon, and has earned a strong reputation due to their reliable quality service. Their work involves all aspects of shop fitting finishes, bars, restaurants, clubs, hotels, offices and homes. Please contact a member of the SG Polishing team for a free estimate. All jobs large and small will be catered for and customer satisfaction is the prime objective.